This weekend, like a good little tourist, I went to Antigua to see the processions for Semana Santa. Before I say more, please note what is happening with the statues in the picture of the fountain above. Amazing. 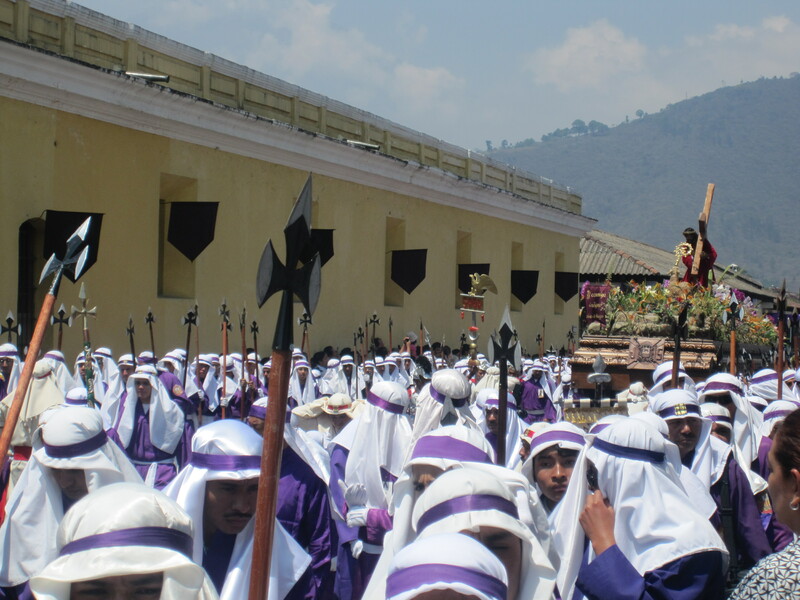 Anyways, I had no idea that Semana Santa was such a big deal in Guatemala, in Xela all the schools were closed, and most businesses took a holiday as well. When I was walking to school on Thursday morning it was like an atomic bomb had gone off, there were no cars, no people, no open tiendas… for the first time ever even the beer factory had closed its gates. In Antigua, however, it was a different story. There were tons of people in town just for the weekend, visitors not only from Guatemala, but from all over the world, and because it was the busiest weekend of the year, everything was open. Based on what other travelers had told me, I was picturing Antigua like Disneyland, nothing more than a little town filled with over-weight white people and no real culture. Instead, I was pleasantly surprised, and I didn’t find Antigua over-crowded or too toursity at all. Well, at least not as touristy as I had imagined. 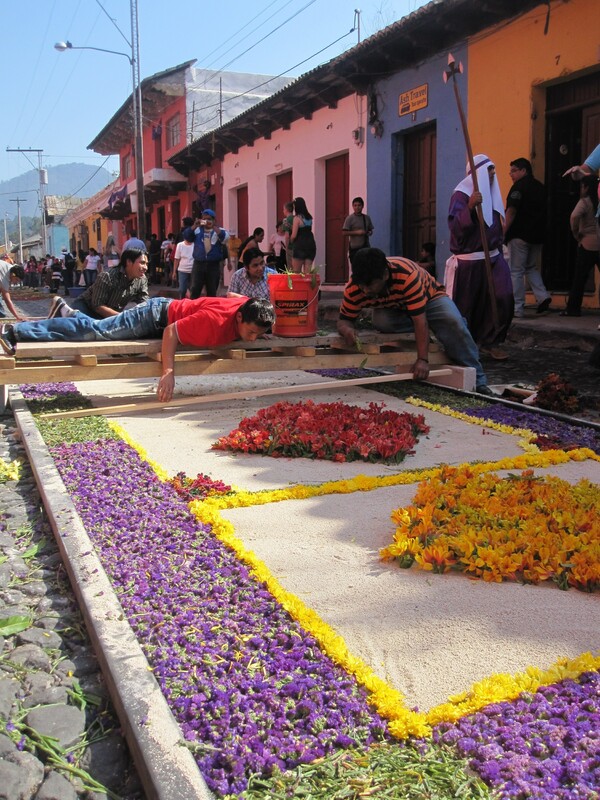 All throughout the weekend people create alfombras, or carpets, in the streets that the processions then pass over. 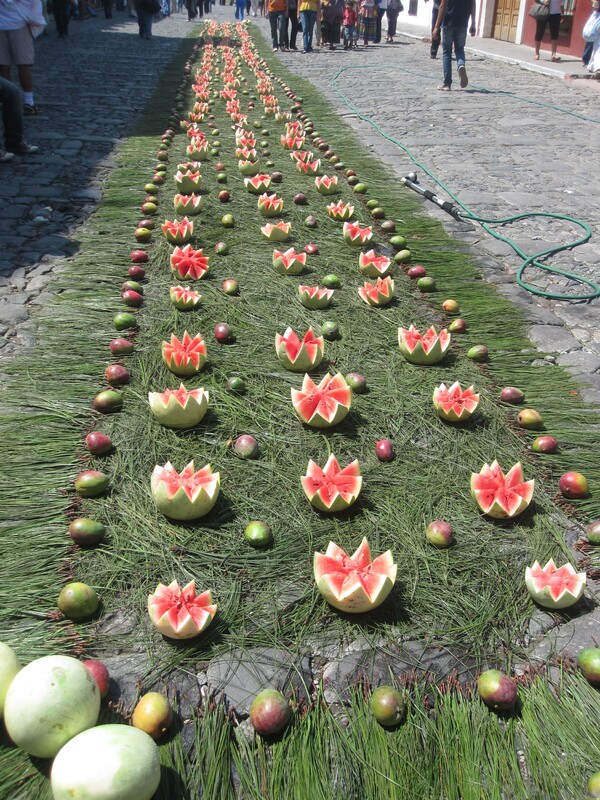 It takes between 3 to 7 hours to create an alfombra, and some of them are pretty creative, like the watermelon one above. They are made out of all kinds of material, including colored sawdust, sand, vegetables, fruits, flowers… I even saw one made out of chocolate, and the waste just about broke my heart. I think it is just families or groups of friends that make these carpets, although the ones next to churches seem to be done by professionals. To me it seemed incredible to put so much work into something that so quickly afterwards would be ruined, but I guess that is a good life lesson. The processions themselves are a whole other elaborate affair. I was lucky enough to stumble upon this one on Friday, and see it the whole way through. It started with about 100 men dressed up like Romans, who were followed by different men carrying crucifixes who were being ‘beaten’, who were then followed by the men above dressed in purple carrying a big Jesus and his cross, who were followed by a marching band, who were followed by a big dump truck with a cleaning crew that immediately scooped up what remained of the alfombras. Whew. Friday before 3pm almost all of the men wore the purple dress above, but after three the men and women changed into black, which they wore until Easter Sunday. The processions Friday night included a Jesus in a coffin, and the processions Saturday included a big cross with just a skeleton next to it. I missed the processions Sunday, but I imagine that they included a happier and more alive Jesus. During my weekend I was also able to climb the active Pacaya Volcano, the first real exercise that I had done in nearly two months. 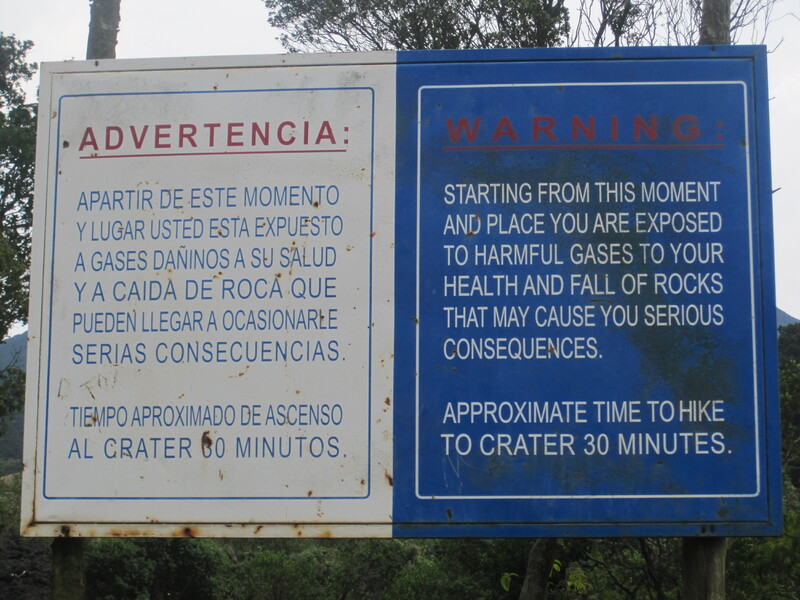 Fortunately, the climb was pretty easy, but unfortunately my group didn’t experience as much activity on the volcano as usual. 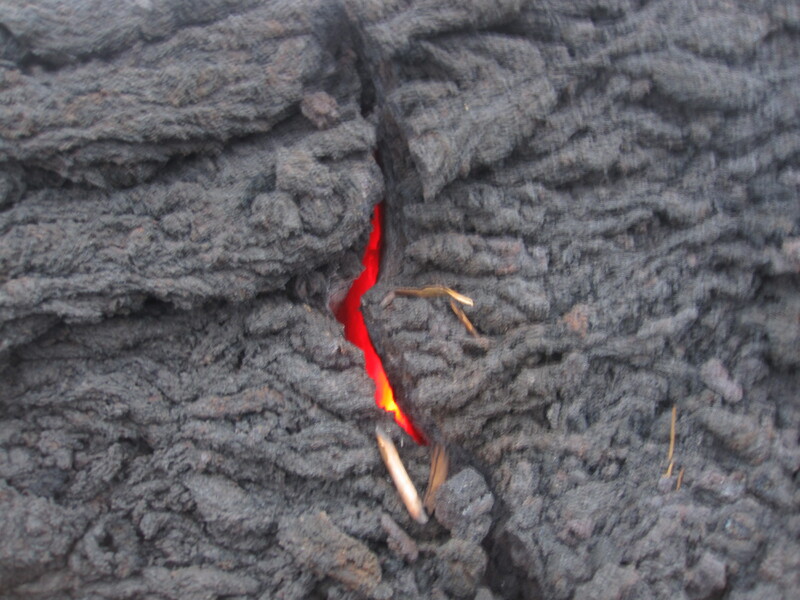 I was still excited to be able to be so close to real magma, I took the picture below without any zoom, simply by pointing the camera down at the ground I was walking on. We also bought some marshmallows and roasted them at the top over the magma, definitely an experience that I probably will never have again in my life. For the record, they were delicious. In the end, I was more than ready to head back to Xela. 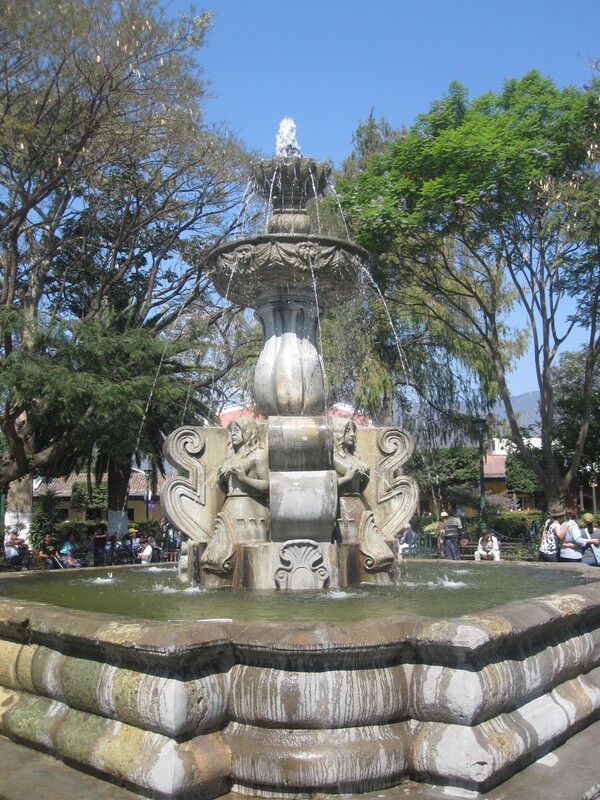 Antigua was nice, but for me, Xela feels like home. Halooooo from the West Coast!